Collection: Inspiration taken from the North Pole with references to the hiking world and glaciers. Trainers are adorned with faux fur and boots made from technical materials are decorated with karabiners, ropes and reflective strips.Note: The development of outerwear pieces with enveloping puffa jackets and comfortable parkas.+ Supple and XXL bags.Interview with Andrea Della Valle:We were the pioneers in the 80s and the 90s, pioneer sneaker, luxury sneaker, and now this moment that everybody really approached the sneaker mania is more important that Hogan really precise that we are in the top player, how you say. Especially this season is like this it’s a northerner, Sweden but the principle is a mood of cold but winter but city, city. 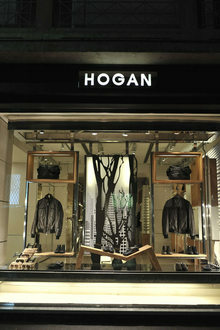 We are like an urban, we like, our true motto is the urban chic luxury sneaker, this is the principle of what is Hogan.The last few seasons the new generation they are very very more prepared, well prepared about, they care a lot about the heritage in this moment. Of course they want a very contemporary way, but they want to know behind, what there is behind, what there is behind this brand, behind the, they want to know the story, that a few years ago was like this. Now this is very important, of course the quality. Today they also want a capsule collection for example, it is very important there are new approach between the new generation of singers, street style, and we have to find the right balance. Italian luxury group Tod’s said on Wednesday nine-month sales dipped 2.2% on the back of lower revenues across its own Tod's and Roger Vivier footwear brands. 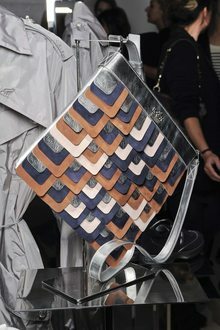 All about making craft work sensual at Loewe in another memorably staged show for the Madrid-based house by their creative director, Northern Irishman Jonathan Anderson. High-end brands such as Kering's Gucci, Prada and Balenciaga are increasingly looking to sneakers for growth, putting them in direct competition with sportswear giants like Nike , Puma and Adidas. 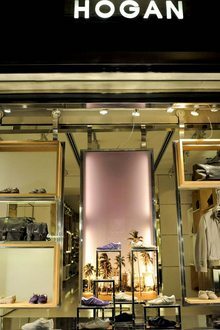 Italian luxury group Tod’s like-for-like sales should improve in the second quarter of the year and turn positive starting from the second half, its Chief Financial Officer Emilio Macellari said on Wednesday. Spanish designer brand Loewe has announced the 30 finalists who will be competing to win the second edition of Loewe Craft Prize. The winner will be announced on 3 May and receive 50,000 euros. Perry Ellis' Original Penguin has teamed up with denim virtuoso Adriano Goldschmied to produce a collection bringing together heritage and innovation to launch this Fall. Perry Ellis International, Inc. has entered into a licensing deal with Cia. Mexicana de Trajes, S.A. de C.V. for the design and distribution of Original Penguin tailored apparel in Mexico beginning this fall. The manager, ex Bulgari, replaces Stefano Sincini. He will take charge of the footwear group as GM from 1st December, while his appointment as CEO will be made official in April 2018. Italian luxury group Tod's said on Thursday it was ready to make short-term sacrifices in margins and revenues in pursuit of medium-term growth as it turns away from fashion to focus on higher-end products. There was a new, giddy and youthful buzz at London Fashion Week Men’s this season, in part boosted by the surprise showing in the UK elections of Jeremy Corbyn, a 67-year-old much admired by young people in Britain. The luxury retailer will host a pop-up on June 1 to launch the new women's ready-to-wear label by Buenos Aires-born Sofia Sanchez de Betak. While US retail is booming, it's not from traditional retail. Of the big four set to report earnings next week, only Nordstrom is forecast to report any growth, while Macy's, Kohl's and JCPenney will likely disappoint. The Italian luxury footwear label had a very disappointing year in 2016, with a net income of €86.3 million, down 6.9% compared to 2015. A downsizing of its store network is on the cards.